Since 2000, the Museo dell’Opera di Santa Croce includes all the rooms and art works that belong to the Santa Croce Complex: Basilica, Museum and Cloister are accessible with a single ticket. The Basilica of Santa Croce was born as the “church of the Florentine citizens”: the construction works were in fact paid by citizenship at the end of the thirteenth century. At the origin located outside the city walls, it was built on a pre-existing Franciscan church, attributed to Arnolfo di Cambio. The façade, in gothic revival style, dates back to the mid-nineteenth century. Santa Croce Church is a museum itself and houses many richly frescoed chapels dedicated to the rich Florentine families who financed the building, and many tombs of famous Florentines. Among the works contained in the Basilica without doubt the most important is the Crucifix by Donatello, unique wooden work of the artist come down to us. Other important works preserved in the Basilica of Santa Croce are the Annunciazione Cavalcanti by Donatello and the Marble Pulpit by Benedetto da Maiano. The church also houses a Medici Chapel, designed by Michelozzo. The Basilica of Santa Croce, always used as a burial place of wealthy citizens of Florence, became in the nineteenth a proper Pantheon of artists and writers. Michelangelo, Galileo, Leon Battista Alberti, Vittorio Alfieri, Ugo Foscolo are just a few of the characters who rest in the church. It was also designed to accommodate a grandiose monument Dante Alighieri, the greatest living poet of the city of Florence, but at the end his body remained in Ravenna, where he died in exile. 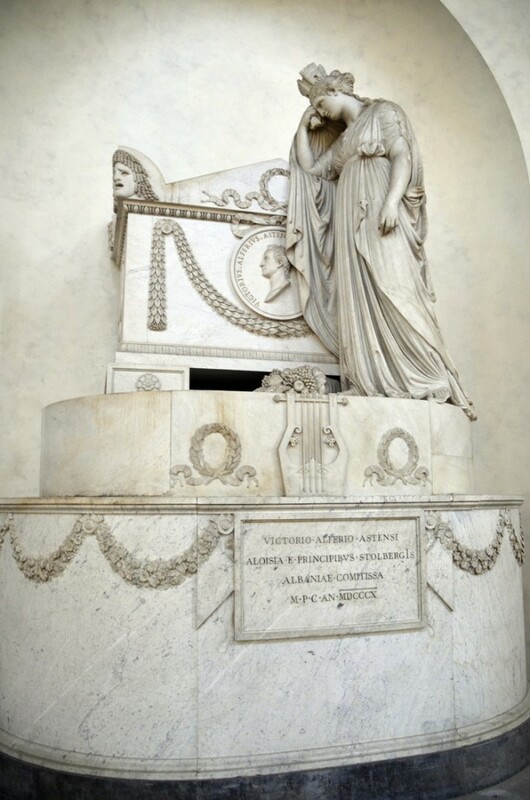 Famous are the funeral monument to Carlo Marsuppini, made by Desiderio da Settignano, the tomb of Michelangelo designed by Vasari, the funeral monument to Vittorio Alfieri by Antonio Canova, and the monumet to Niccolò Machiavelli, fine example of Florentine neoclassicism. The museum was established in 1959 in the space previously occupied by the convent and has been carefully restored after the damage caused by the 1966 Florence flood. It houses beautiful works of art of the Florentine school. Absolute masterpiece among the works that hosts is the Crucifix by Cimabue, placed in the fourteenth century Refectory. Symbol of the passage to modern painting, is sadly become an emblem of the destruction caused by the 1966 flood. In the museum you can also admire the beautiful frescoes by Taddeo Gaddi and Orcagna, which were covered by some renovations in the sixteenth century. The museum also houses a collection of glazed terracotta by Della Robbia School, a magnificent gilded bronze sculpture depicting St. Louis of Toulouse by Donatello, some paintings, and wooden furniture. Instead, it must still return to its place in the museum’s Last Supper Vasari, still being restored after the damage caused by the flood of Florence. The Pazzi Chapel designed by Brunelleschi is an architectural masterpiece of the complex of Santa Croce. Jewel of Renaissance architecture, it also features decorations by Desiderio da Settignano and Luca and Andrea della Robbia. You can access the Pazzi Chapel from the beautiful convent cloister. Closed on 1 January, Easter Sunday, June 13, Oct. 4, 25 and 26 December. By purchasing one of these tickets you can visit all the Monumental Complex of Santa Croce which includes Museum, Basilica, Cloisters and the Pazzi Chapel.